The M/V Chelan en route to Anacortes, Washington from Sidney on Vancouver Island. Mount Baker is in the background. Sue Frause photo. 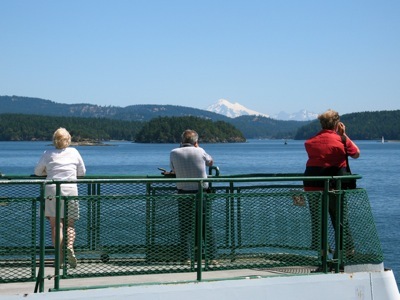 Good news for people who both enjoy and rely on the ferry between Washington state and British Columbia. Sunday, March 28, 2010 is the date the Washington State Ferries' Spring Schedule goes into effect. Among other things, it means that after a winter hiatus, service will resume between Sidney on Vancouver Island and Anacortes, Washington. You can read more about it and see a slide show of my photos at my Seattle Travel Examiner site. I'm so glad my direct link to Vancouver Island has returned once again, as are folks up in Canada. Read this article in the Victoria Times Colonist: Chelan's return worth celebrating.